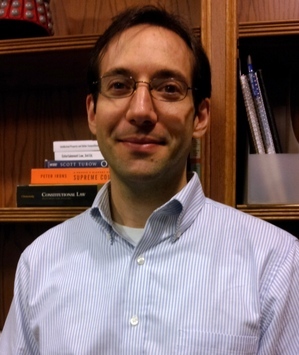 Our series profiling the next generation of special collection librarians and curators continues today with Ryan Greenwood, the 2013-2014 Yale Law Library Rare Book Fellow, in New Haven, Connecticut. I was in graduate school, and doing research in archives and with early printed books. While I was looking for specific topics, I noticed more and more about the books themselves. Some bindings were in such poor condition that they gave a kind of surgical view of the books, which was fascinating. Then there was the marginalia - one of the first times I saw a manicule, it pointed me to the section of text I was looking for. In other cases, annotations gave great references to other texts. The historical and artifactual value of these rare books immediately became real for me. A little later, I took Mike Widener’s course at Rare Book School in Virginia, on collecting historical law books. The experience was terrific, and got me hooked. At that time, I was also working as an intern at Columbia’s Rare Book and Manuscript Library, and had a chance to work up close with illuminated manuscripts and identify manuscript fragments, really for the first time, under Consuelo Dutschke. It was all pretty extraordinary. I have an MLIS from Rutgers and a PhD in Medieval Studies from the University of Toronto. I am the Rare Book Fellow this year in the Lillian Goldman Law Library, Yale Law School. My role is to learn the elements of rare book librarianship - and especially rare law librarianship - under the guidance of Mike Widener, the Rare Book Librarian, and in the midst of the outstanding Rare Book Collection at the Goldman Law Library. The training includes extensive work with collection development, cataloging, reference, outreach, exhibit curation and digital projects. The fellowship is well-structured but varied, which makes for a very stimulating experience. From daily reviews of catalogs to building relationships with booksellers, from improving catalog records to curating exhibits and developing digital projects, it has been busy and exciting. Two interesting projects have been the arrival of the Kuttner Collection of (largely) medieval canon law, which required quite a bit of coordination between an institute in Munich, where the library was hosted previously, and the Goldman Library; and a major digitization project for a commercial vendor, which I have been able to help consult on. As with most librarians, I love the diversity of the roles. But I have to say that one of the most gratifying has been outreach, particularly in the form of tours and presentations. The feedback is always positive and it is easy to get students, alumni and visitors excited about the Library’s Rare Book Collection. In all, it has been a terrific year so far, and has provided an excellent foundation for further work. That’s a tough one. Some of the Library’s new acquisitions are favorites. Recently the Library acquired a once-in-a-generation trove from Anthony Taussig, who put together the world’s finest private collection of historical books on English law. One of these is the first printed book of English law, an abridgement of statutes, printed by Lettou and de Machlinia in 1481 or 1482. Another is the first printed justice of the peace manual, produced in 1506 by Wynkyn de Worde. Both have been great to work with and to present to tour groups and visitors. I could mention quite a few, but in the collection there is also a tiny and wonderful manuscript of Magna Carta, with red and blue penwork decoration and even some (very small) annotations. It is really appealing, and a real working copy of the text. And there are some manuscript case reports for the King’s Bench and Common Pleas which are fascinating, partly because there is not very much known about them. I have a growing collection of bookseller catalogs. The meta-collecting feels a little like a real book collection, and certainly helps to build real collections! It’s the physical connection with the past - the amount of digitized material is already enormous, but seeing rare books online versus having the physical thing is kind of like seeing pictures of Paris and going to Paris. It’s a very different experience. The object has a direct connection with the past that is very real. As one example, another justice of the peace manual in the collection has burnt edges and still smells like (what I think is) gunpowder. That is a really tangible addition to the experience, and allows you to understand something--even feel something--that you would not have otherwise. But I don’t think many people believe that rare books are disposable or should be buried somewhere. And I think the digital age is bringing new possibilities and new interest to rare books, and that is very exciting. I think it’s bright. I think one key is the synergy between digital projects and special collections and rare book librarianship. The huge number of digital projects are varied, useful and appealing for librarians, various other educators and audiences, and they will continue to point back to the physical collections which underlie them. At the same time the easy access and appeal of digital collections challenges rare book and special collections departments to expand outreach and teaching opportunities in new ways, and to promote new digital projects. It’s a complimentary process which pushes libraries outward, and encourages increased collaboration with academic departments and other institutions. Coordinating this is a challenge, but an exciting one, and the value in doing it is very high. The Taussig collection is really outstanding and bears mention again. We’ve just received the second round of Taussig acquisitions, so that the collection now runs to over 350 volumes, some of which are extremely rare or unique in North America and Europe. It is hoped that it will encourage the study of English legal history here, particularly between the 16th -18th centuries. There are a number of others, but I’ll just mention the Italian statute collection briefly. The library has over 800 printed volumes and 55 manuscripts, the best collection of statutes anywhere outside of Italy, and which offers good insight into the administrative histories of a wide range of Italian towns and cities. A new brochure highlights some other collection strengths - or come visit and we can tell you about them! There will be an exhibition of the Taussig acquisitions to open in late August, and a full day of talks and tours for it on October 3, 2014. The Law Library, together with the Beinecke Rare Book and Manuscript Library, has invited Sir John Baker, the great historian of English common law, as the keynote speaker. We are also mounting a new exhibit in the next week to coincide with the annual “Rebellious Lawyering Conference” at Yale Law School. It deals with law and lawyers who work for social justice, and we have some great books to showcase the conference. We will also put the exhibit up on Mike Widener’s Rare Books Blog. Please visit, it’s a great place for news and events relating to the Library’s collection. Please also visit the Flickr site for the collection, where there is a wonderful array of images from law books. I was in graduate school, and doing research in archives and with early printed books. While I was looking for specific topics, I noticed more and more about the books themselves. Some bindings were in such poor condition that they gave a kind of surgical view of the books, which was fascinating. Then there was the marginalia - one of the first times I saw a manicule, it pointed me to the section of text I was looking for. In other cases, annotations gave great references to other texts. The historical and artifactual value of these rare books immediately became real for me. A little later, I took Mike Widener's course at Rare Book School in Virginia, on collecting historical law books. The experience was terrific, and got me hooked. At that time, I was also working as an intern at Columbia's Rare Book and Manuscript Library, and had a chance to work up close with illuminated manuscripts and identify manuscript fragments, really for the first time, under Consuelo Dutschke. It was all pretty extraordinary. The fellowship is well-structured but varied, which makes for a very stimulating experience. From daily reviews of catalogs to building relationships with booksellers, from improving catalog records to curating exhibits and developing digital projects, it has been busy and exciting. Two interesting projects have been the arrival of the Kuttner Collection of (largely) medieval canon law, which required quite a bit of coordination between an institute in Munich, where the library was hosted previously, and the Goldman Library; and a major digitization project for a commercial vendor, which I have been able to help consult on. As with most librarians, I love the diversity of the roles. But I have to say that one of the most gratifying has been outreach, particularly in the form of tours and presentations. The feedback is always positive and it is easy to get students, alumni and visitors excited about the Library's Rare Book Collection. In all, it has been a terrific year so far, and has provided an excellent foundation for further work. That's a tough one. Some of the Library's new acquisitions are favorites. Recently the Library acquired a once-in-a-generation trove from Anthony Taussig, who put together the world's finest private collection of historical books on English law. One of these is the first printed book of English law, an abridgement of statutes, printed by Lettou and de Machlinia in 1481 or 1482. Another is the first printed justice of the peace manual, produced in 1506 by Wynkyn de Worde. Both have been great to work with and to present to tour groups and visitors. I could mention quite a few, but in the collection there is also a tiny and wonderful manuscript of Magna Carta, with red and blue penwork decoration and even some (very small) annotations. It is really appealing, and a real working copy of the text. And there are some manuscript case reports for the King's Bench and Common Pleas which are fascinating, partly because there is not very much known about them. It's the physical connection with the past - the amount of digitized material is already enormous, but seeing rare books online versus having the physical thing is kind of like seeing pictures of Paris and going to Paris. It's a very different experience. The object has a direct connection with the past that is very real. As one example, another justice of the peace manual in the collection has burnt edges and still smells like (what I think is) gunpowder. That is a really tangible addition to the experience, and allows you to understand something--even feel something--that you would not have otherwise. But I don't think many people believe that rare books are disposable or should be buried somewhere. And I think the digital age is bringing new possibilities and new interest to rare books, and that is very exciting. I think it's bright. I think one key is the synergy between digital projects and special collections and rare book librarianship. The huge number of digital projects are varied, useful and appealing for librarians, various other educators and audiences, and they will continue to point back to the physical collections which underlie them. At the same time the easy access and appeal of digital collections challenges rare book and special collections departments to expand outreach and teaching opportunities in new ways, and to promote new digital projects. It's a complimentary process which pushes libraries outward, and encourages increased collaboration with academic departments and other institutions. Coordinating this is a challenge, but an exciting one, and the value in doing it is very high. The Taussig collection is really outstanding and bears mention again. We've just received the second round of Taussig acquisitions, so that the collection now runs to over 350 volumes, some of which are extremely rare or unique in North America and Europe. It is hoped that it will encourage the study of English legal history here, particularly between the 16th -18th centuries. There are a number of others, but I'll just mention the Italian statute collection briefly. The library has over 800 printed volumes and 55 manuscripts, the best collection of statutes anywhere outside of Italy, and which offers good insight into the administrative histories of a wide range of Italian towns and cities. A new brochure highlights some other collection strengths - or come visit and we can tell you about them! There will be an exhibition of the Taussig acquisitions to open in late August, and a full day of talks and tours for it on October 3, 2014. The Law Library, together with the Beinecke Rare Book and Manuscript Library, has invited Sir John Baker, the great historian of English common law, as the keynote speaker. We are also mounting a new exhibit in the next week to coincide with the annual "Rebellious Lawyering Conference" at Yale Law School. It deals with law and lawyers who work for social justice, and we have some great books to showcase the conference. We will also put the exhibit up on Mike Widener's Rare Books Blog. Please visit, it's a great place for news and events relating to the Library's collection. Please also visit the Flickr site for the collection, where there is a wonderful array of images from law books.